Each of these header types has a one-byte Next Header field, and a one-byte Header Extension Length field that indicates the headers overall length. The rest of the header has one or more option fields. Figure 109 illustrates the overall format of these two headers. 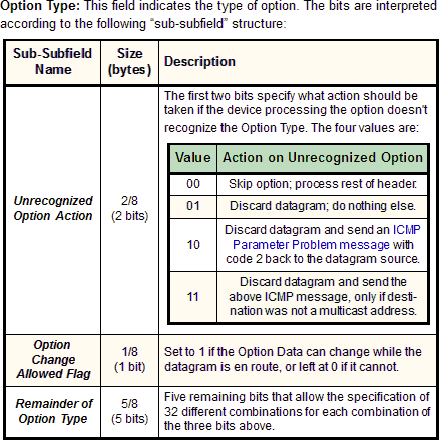 The format of each option is similar to that of IPv4 options, and is shown in Table 73. Each of these extension headers begins with two fixed fields, Next Header and Header Extension Length. The rest of the header consists of a sequence of variable-length options. Each option has the structure shown in Table 73, consisting of a type / length / value triplet. 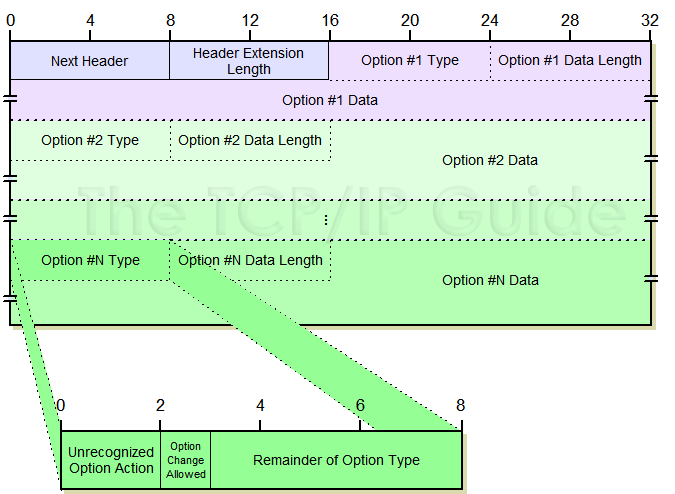 Option Data Length: Specifies the length of the Option Data subfield below. Note that this is a change in semantics from IPv4, where the length field indicated the size of the entire option; in IPv6 the length of the Option Type and Option Data Length fields are not included. Option Data: The data to be sent as part of the option, which is specific to the option type. Also sometimes referred to as the Option Value. Note: The Option Type subfield is a bit strange in terms of how it is interpreted. Even though it has a substructure with three sub-subfields as shown in Table 73, that structure is informal. What I mean by this is that the 8 bits of this field are taken as a single entity. Despite the special meaning of the three highest-order bits, the entire field is called the Option Type, not just the last five bits, and the whole is used as a single value from 0 to 255. In fact, the sub-subfield names aren't even specified in the standard; I made them up to help explain these fields. Since each option has a subfield for type, length and value (data), they are sometimes said to be TLV-encoded. If there are multiple options, they are placed one after each other in the header. At the end of all the options in a Hop-By-Hop Options or Destination Options extension header, padding may be placed to ensure that the header is a multiple of 8 bytes in length. Key Concept: Two IPv6 extension header types, Hop-By-Hop Options and Destination Options, are used to carry arbitrary optional information in IPv6 datagrams. Each consists of a set of variable-length options that are defined using three subfields indicating the options type, length and value.